Sk-JAY? Maybe the “J” is silent, so it must by SKAY. Or Sh-Jay?!?!? Actually, his last name is pronounced Shay and you better get used to hearing it. Of late, Brady Skjei has been getting a ton of attention playing on yet another powerhouse U.S. National Development Team. They are currently in the midst of going for their 4th straight U-18 World Championship in Brno, Czech Republic. The team has an undefeated record and secured their spot in a semifinal game by knocking off Canada 5-3 yesterday afternoon. Skjei, along with fellow blueliners Seth Jones, Jacob Trouba, Connor Carrick, Matt Grzelcyk, Pat Sieloff, and Will Butcher, have helped the US post three shutouts in the four games they have played. A few days ago, ISS posted their monthly Top 30 rankings for April. Skjei has made the list every month since October, and this month was no exception. Coming it ranked 24th, Skjei has been getting tons of well deserved praise from scouts on his two-way defensive game, fluid and agile skating, and jumping into the play to create a chance or stop an opponent. Those are some pretty nice attributes to have, especially if your going to play for the D1 college team every Minnesotan dreams of playing on. As a boy growing up in Minnesota, a life goal is to suit up in the maroon and gold and dawn the Golden Gopher crest for the University of Minnesota. Brady Skjei committed to Minnesota and looks to develop his game next season on an already stacked squad filled with NHL drafted talent (Bjugstad, Rau, Ambroz, etc.). After making a promising run to the Frozen Four this year before getting bounced by the eventual champions, Boston College, Skjei has all the tools and the teammates to help the Golden Gophers make a run for its first National Championship since 2003. 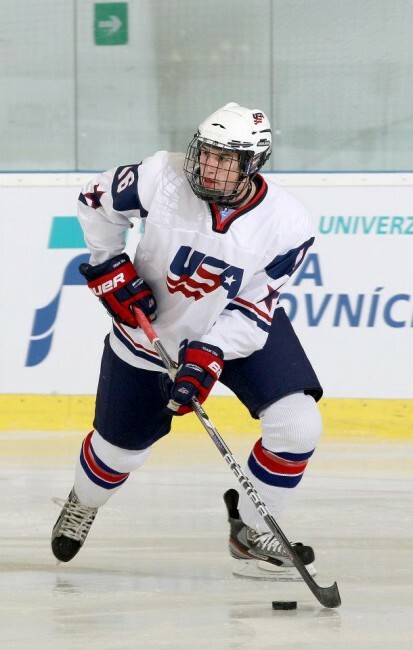 But first, a gold medal in the U18 World Championships will do just fine for Brady. In nine international games that Skjei has suited up for, he has a total of 4 points (1G, 3A). Top 4 defenseman capable of controlling the powerplay.